In their article, Greg and Jill Delezynski explain how they began making videos of their cruising adventures on the West Coast of North America (San Francisco to the Baja). Once they had the video footage, they learned how to edit and package these stories of their travels as DVDs . . . on a budget and while living aboard in a small space. This supplement to their article presents the how-to steps for those who are interested in producing DVDs for fun or profit. 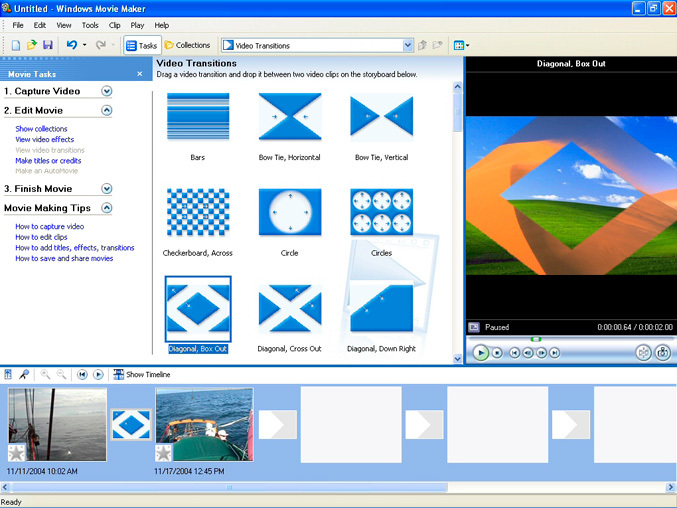 Greg and Jill used Windows Movie Maker software, but the process is similar to those used in other video-editing applications. With our first tape in the camera, we selected, "capture the full tape." We also had the "split into scene" box checked (more on this later). We were surprised that, while using Movie Maker, the camera was completely controlled by the computer. The camera did a rewind to make sure it was at the start of the tape. It then began to play the tape. As the camcorder played, we could see the video on a small screen on the laptop as it was simultaneously recorded onto the hard drive. We soon learned that the process of transferring the video to the computer was a "real-time" process. That means for every hour of videotape, it takes an hour to move it to the computer. So be prepared to sit back, have a cup of coffee, and relax as the transfer runs. Once the tape was done playing, the program went to work for a minute or so, then a batch of what looked like photos showed up in the center panel of the program (see image above). Each of the photos is actually the first frame of the video clip, and represents a bit of video. This was done because of that checkmark on the "Split into scene" box we checked before we started the save. Now, the real work begins! You move from the "1. Capture Video" step to the "2. Edit movie" mode. 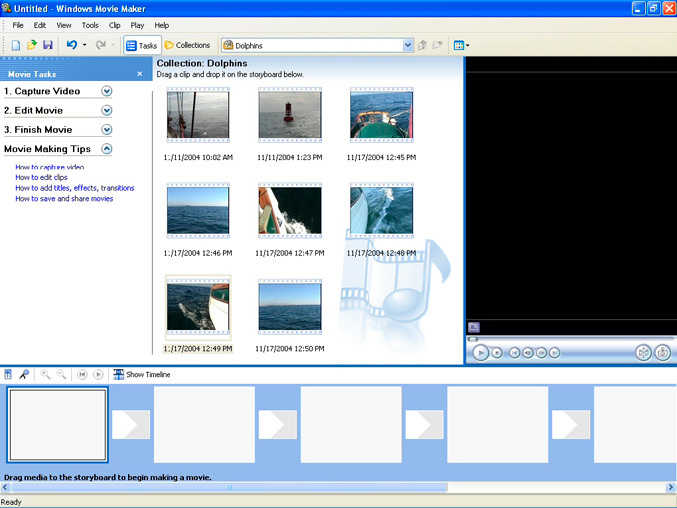 At the bottom of the Movie Maker screen, you can see either a series of boxes, alternating between large and small, called a "storyboard view" or a long bar running from side to side, called a "timeline view." We like to start in the storyboard view. We can now select the first video clip (small photo from the center panel) to put in the first box at the bottom left of the screen. This "clip" is actually a short section of video. It's a simple drag-and-drop move. Once the clip is in the first position, you can select another clip to put into the next box. It can be the next clip in the order you shot the video or one from later in the tape. You will notice that the clips will only drop into the large boxes. The smaller gray boxes between the boxes that hold the video clips represent what "transition" takes place between the two video clips when viewing the video. More on this shortly. During the "edit movie" process, you will want to switch between the storyboard and timeline view. Some tasks are easy to perform in one view but harder to do or understand in the other view. You can easily switch between the two ways to view your work by clicking on the small icon just above that first clip: "Show Timeline." In the timeline mode, you will see a small photo representing the section of the video clip and then a bar that extends for the duration (in time) of how long that clip runs. To switch back, simply click on the "Show Storyboard." 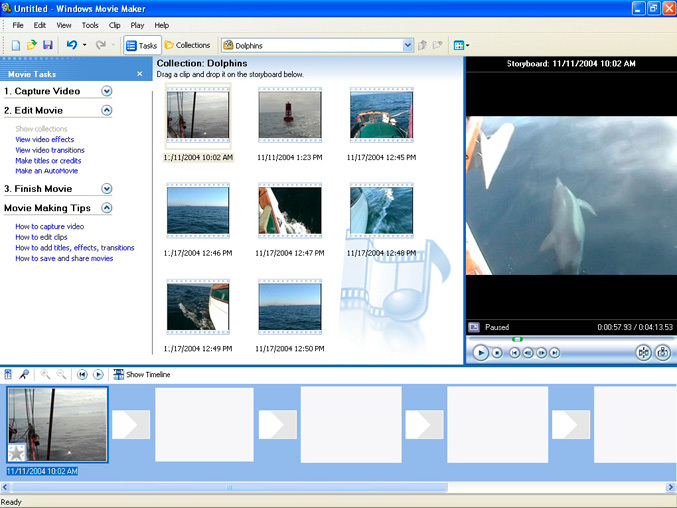 In either case, you can then play the clip using the standard VCR-type controls on the right side of the screen just under the left side of the preview window. You can also cut the clip into parts and remove anything you do not want in the final video. To cut the video in any place or frame you want, just let the timeline play until the exact spot you want to cut it. Then simply click the "split film" icon (the one just to the left of the icon that looks like a camera) just under the right side of the preview screen. You will see the video in the timeline area split into two. Next, you can cut it a bit further on and you can then click on the part of the clip you do not want and simply hit the delete key. Presto, the area you do not want goes away and the rest of the video snaps back to fill the gap! Don't worry, this delete is a non-destructive delete. The actual video is still in the computer, it's just no longer in the video you will be viewing. You can always get it back. You repeat this a number of times until all of the video in the timeline is what you want in the final movie. Next, it's time for a bit of fun! Move to the "Show Storyboard" view. Between each of the blocks, you see a smaller box. Still in the step "2. 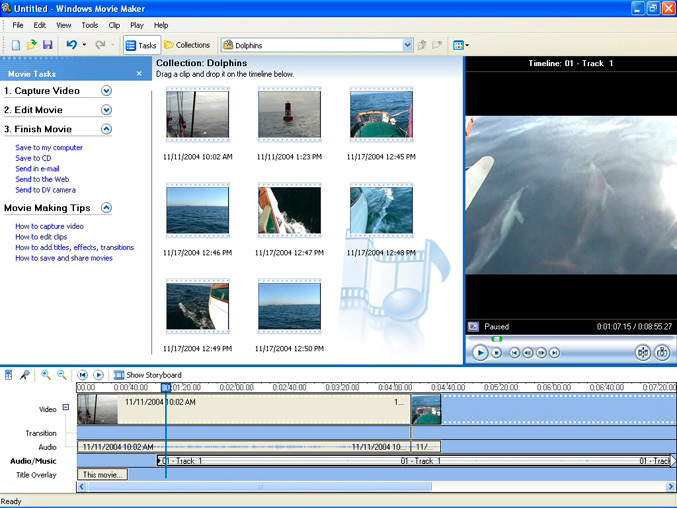 Edit Movie" area, click on the "View video transitions." A new batch of items pops up in the middle where your video clips were. These are the transitions. Each one will control how one section or clip of your video will move into the next. If no transition is used, as you move from one clip to the next, it will be a sharp snap to the next video. If you drag and drop a transition, like "Fade," to that smaller box between your clips, when the video is played, the first clip will fade into the next. By clicking one time on a transition and then clicking on the play arrow under the preview screen, you will see how the transition looks on a couple of unrelated pictures. As long as we were at it, we knew we also had a batch of still photos on the computer. We went back to Step 1 and clicked on the "Import Pictures" and loaded into the video a couple that we liked by placing them on the timeline between the video clips. Being a bit creative, you can use different transition to move from one photo to the next and even add the sound of a shutter click as the video plays. We repeated the process of adding video and still photos, cutting, trimming, and inserting transitions until we had all of the video on the timeline and the video was about as long as we thought a viewer could stand. This is where your own judgment and creativity come in. WOW! Now when we selected the "play" function on the timeline, it was beginning to look like a real video! We suggest that you start by making a few short videos, in the 3- to 5-minute range. It's easier to learn how it's all working and get a couple of successes under your belt before you tackle that 4-hour epic. When watching the video, you will realize how much music adds to the overall feel of the movie. You can go back to Step 1 and click on "Import audio or music." You can then select from any music you have on your computer. Once you select the music or sound from your computer, an icon will show up in the center "Collection" area that looks like a square with a note in it. You can then do the same drag and drop to get the sound into the "Timeline" view in the "Audio/Music" row. Now as you play the video, you will see the video and hear the extra music you just added. Just like the video on the timeline, the audio may also be cut and shortened or parts removed. You can also select the "microphone" icon on the bottom left side of the screen and record narration for your video. If you are not going to sell your video, the sky is the limit on adding music. However, if you feel that you may someday want to sell your video, remember that copyright laws apply to any music you use. At this point, we were no longer looking at the clock to see how long we had been working on our video. We were now looking at the calendar! One last bit of editing that nicely finishes off the video is adding in titles. When you select "Make titles or credits," a screen with a lot of options opens. You can add titles to the beginning of the video, credits at the end, and even text that flows over the video you shot to help explain items. We then moved on to the "3. Finish Movie" area. We found that the best way to start was to make a couple of movies and send them home to friends and relatives. The fastest way to share very short videos is to send them by email by selecting "Send in an email." Or you can select the option of "Send to the Web." There are a number of places on the web that will host short up to 10-minute videos for free. YouTube and Google videos work very well. Once you've sent your short video to the web, your friends and family can view them without waiting for the mail system. YouTube and Yahoo video are a fun place to share and see what others are doing. You can easily lose a day there. A second bonus feature of sending your short video to either one is that you can see how other people view your video. People who watch it can rate your video with a star system and send you feedback. So if you think you have a video that a lot of people will be interested in, post a small part of it there to see how it is received. You get to do a bit of free market analysis. Once you get into doing longer videos, the best way we found was to write it to a CD. We know that sounds strange, but a blank CD is a lot less expensive than a blank DVD. By putting a video on a CD, you are creating what is called a VCD or Video Compact Disk. A VCD normally has about the same quality video as a VHS tape. This is less than a DVD but still very viewable. Most newer DVD players and updated computer DVD players recognize a VCD and will play them just as if they were a DVD. A note here: Windows Movie Maker will not directly burn your video to a DVD. Take heart. You can still make a DVD; it's just a bit more complicated. First, in the "3. Finish Movie," select the "Save to my computer." Enter a name for the video in Space 1 and where on your computer you want it in Space 2. Then click "Next." On this second page, there are three choices: "Best quality for playback," "Best fit to file size," and "Other settings." Select "Other settings" and, in the pull-down menu, chose (in the USA) "DV-AVI NTSC (25 Mbps)." Then use the DVD burning program that came with your computer to move that file to a DVD disk. Later, if you decide to move up to a purchased video-editing program, almost all of them can directly burn your video to a DVD. Greg and Jill Delezynski spent much of their working career dreaming of sailing off to warm waters. In 1996, after moving to the San Francisco Bay area, they moved aboard Guenevere, their Nor'Sea 27, started preparations to the boat and themselves in earnest. They were profiled by Good Old Boat magazine in the November 2002 issue. In 2004, they made the jump; they retired from the working world, sailed out under the Golden Gate Bridge, and turned left. During their adventures, Greg and Jill Delezynski put their video camcorder to a lot of use. They put together a DVD for relatives and close friends. It was well received and a few suggested making it available for the public. With no background in the video industry, they did a lot of Internet investigation. After a few changes were made to the opening and closing of the video, they found a suitable way to publish and distribute the video while still cruising and now they are sharing their adventure with anyone interested. Their first DVD, Guenevere's West Coast Adventure, focuses on their journey from San Francisco to Baja California. The second DVD, Guenevere's First Summer in the Sea of Cortez, picks up in Cabo and follows them north to the Puerto Escondido area. In addition to the first two DVDs, they have released two new videos, Guenevere's Middle Sea of Cortez Summer and Guenevere's Galley, Pressure Cooking. Guenevere's Middle Sea of Cortez Summer picks up where their first Sea of Cortez DVD ends, and travels north as far as the Bahia de Los Angeles area. It depicts the cruising life as they venture through 25 (new to them) anchorages. 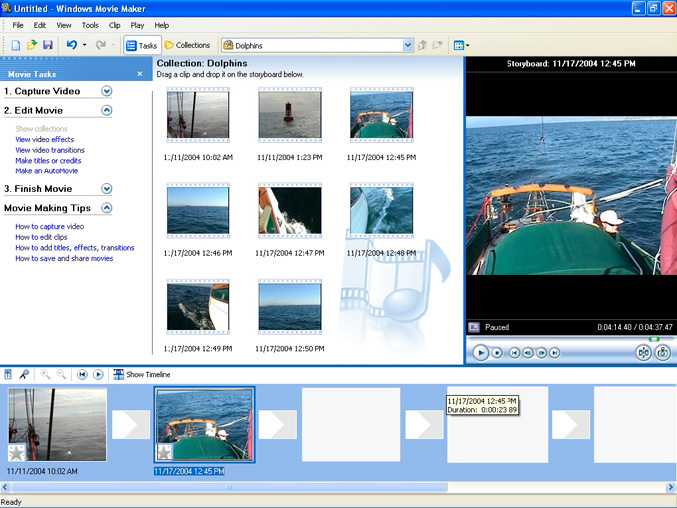 It shows life aboard, sea life, and many aspects of cruising in remote areas. In Guenevere's Galley, Pressure Cooking, they share pressure cooker techniques and seven recipes, including meat and even bread and cake! During three years spent cruising, they met many boaters who had pressure cookers aboard but never used them. This DVD is their way of showing others how easy a pressure cooker is to use. Both new DVDs include music by Eileen Quinn. Greg and Jill are currently cruising the west coast of Mexico with no firm plans other than to keep going as long as it's fun. For Good Old Boat readers, Greg and Jill are offering a special discount. Go to http:www.svguenevere.com to order any of their videos and use the discount code UK96DV6U. You will receive $3.50 off the price of each video. This offer applies only to videos priced at $10 or more (not valid on Guenevere's Quiet Anchorages DVD).